President Yoweri Museveni has downplayed reports of tension between Uganda and Rwanda. This was during a joint press conference between him and Rwandan President Paul Kagame at State House Entebbe, this afternoon. Kagame, arrived earlier yesterday for a one-day state working visit. Kagame, together with his host Museveni first held a closed-door meeting with their delegations that included ministers and senior security officials. Kagame was accompanied by his Foreign Affairs minister Louise Mushikiwabo and the head of Rwandan intelligence Maj Gen Nzabamwita. Recently, Mushikiwabo told journalists in Rwanda that her country would not return ‘evil’ to Ugandans in Rwanda in retaliation to how Uganda was treating Rwandans in Uganda through illegal detentions, torture. Museveni told journalists that he agreed with Kagame to have close cooperation between intelligence services of both countries. He said that the cooperation should not only be in line with security but even other developmental issues. He added that it was important for both countries to first get facts, discuss and where there is merit take legal action. 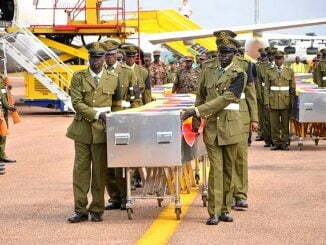 “There is no fundamental problem between Uganda and Rwanda. 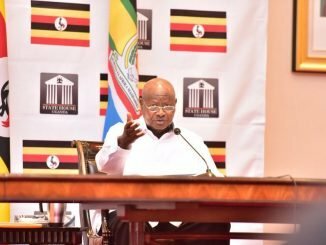 We don’t even have a border problem like with Kenya on issues related to Migingo Island, with Rwanda there is nothing really,” President Museveni explained. Kagame who did not go into details of the security tension between the two countries only emphasised the need to work together, bringing out facts and taking right decisions. When further asked about Ugandans in Rwanda having their contracts terminated under mysterious circumstances, Kagame dismissed the reports saying that there are many things said out of context. The meeting between the two heads of state comes hardly a week after Museveni called off his trip to the Rwandan Capital, Kigali, where he was slated to attend a meeting on the African Continental Free Trade Area Treaty. The decision to cancel the visit, according to Daily Monitor, followed a disagreement between President Museveni’s advance security team and the Rwandan security officials in Kigali. 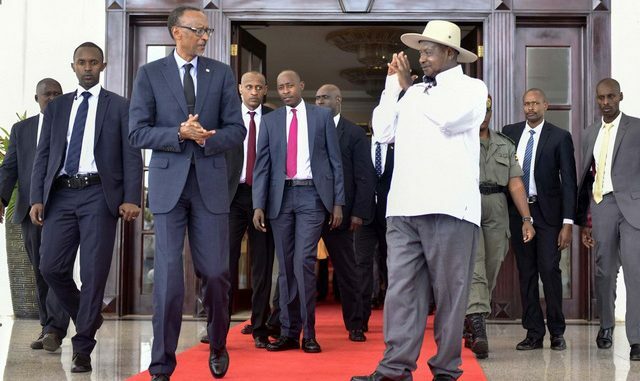 Before this incident, Kagame had skipped the East African Heads of State Summit held in Kampala on February 22 to raise funds for health and infrastructure developments. 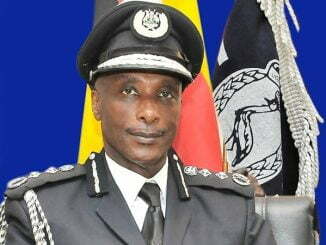 In recent months, there was a purge in the Uganda Police Force in which some senior officers and other civilians are accused of, among other things, kidnapping and aiding the repatriation of Rwandan dissidents. The policemen are currently on trial in the General Military Court Martial. The two governments have also at different times accused each of other of supporting dissidents from the other country and espionage, among others.